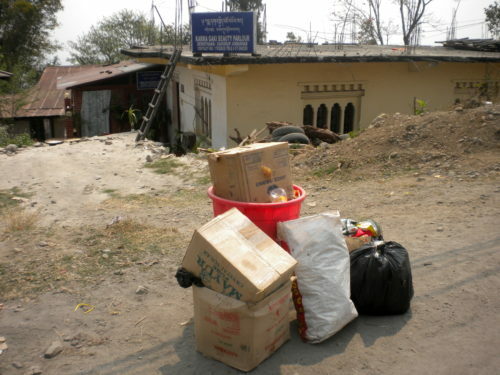 Household waste awaiting collection in Samdrup Jongkhar district. Home to less than a million people, the Himalayan country of Bhutan has one of the world’s fastest growing economies, spurring dramatic increases in waste production. Most Bhutanese live in villages, where waste, including recyclable material, is burned or dumped in pits or off cliffs. A country of high hills, remote villages, and rough roads, transportation of materials is time consuming and costly. Pushcarts are understandably outlawed on the country’s narrow, winding roads, restricting the informal waste trade to towns along Bhutan’s Southern border with India or the country’s few urban hubs large enough to support scrap dealers. In some cases, itinerant waste buyers will travel the countryside buying materials to sell in India. Generally, though, it’s challenging to make economic sense of transporting recyclables hours or days, usually in a rented vehicle, to the Indian border. Where scrap dealers are present, informal waste pickers can make a modest living picking and selling materials. Often times, pickers hold another job and the waste trade merely provides supplemental income. Many of Bhutan’s waste pickers are municipal waste collection workers and “sweepers” who are permitted to supplement their salary by sorting out recyclables on the job, which they can then transport to scrap dealers using municipal vehicles. 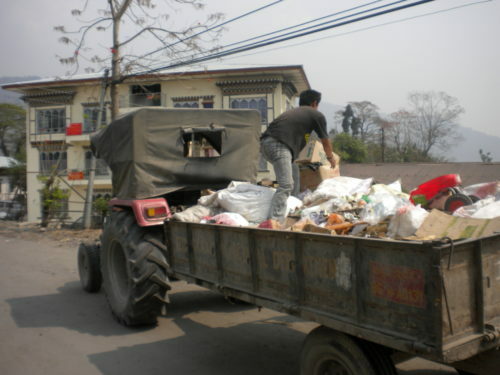 Waste collection in Dewathang (Samdrup Jongkhar district). Waste pickers Sonam Tshering and Lhaki Wangdro 1 work as municipal waste collectors for the Samdrup Jongkhar municipality in SE Bhutan. Paid 5,000-7,000 ngultrum ($75-100 USD) per month by the municipality, together they can make an additional 8,000 ngultrum ($120 USD)/month from the sale of plastic bottles and cardboard, which they recover from municipal waste. Waste picking without such immediate access to household waste is far less profitable, especially in areas where municipal collectors are already segregating materials to sell. At the Samdrup Jongkhar dump, one can sometimes find Indian informal waste pickers who come across the border for materials. A mother and her three children occasionally visit the dump, but complain that it’s hard to find anything valuable there anymore. Bhutanese waste pickers don’t face frequent public scorn, but there is little awareness about their work and little is done to support them. In the country’s National Conference on Sustainable Waste Management of 2014, which hosted waste-related stakeholders from across the country, there were no waste picker representatives. A number of representatives from Bhutanese scrap dealerships were present, however, and municipalities and the United Nations Development Program are increasingly interested in establishing long-term public-private partnerships in waste management throughout Bhutan. The prospect of organizing pickers, especially to effectively engage government, seems bleak without considerable support from the Civil Society Organization (CSO) sector. Because pickers often hold another job, they don’t hold a strong identity solely as pickers, and may not consider organizing themselves with other waste pickers do to perceived competition, humility or linguistic and geographical barriers. Even if informal waste pickers were to organize themselves, the practice is highly dependent upon access to scrap dealers. 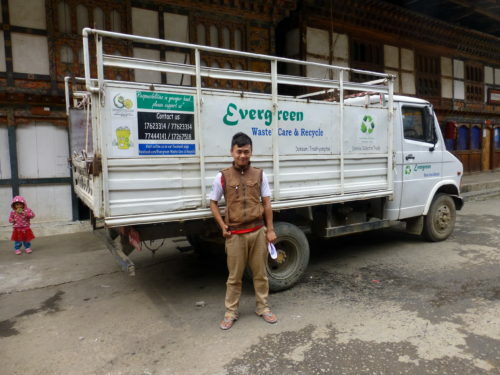 Tshering Dorji is an impassioned young scrap dealer who recently launched a new business, his third such attempt, called Evergreen Waste Care and Recycling, in Doksum village, a small transport hub in Bhutan’s remote Trashiyangtse district. With a small truck, Tshering Dorji is able to collect materials from the local community and store them on a plot of land that he leases from the local government at the low cost of 5,000 ngultrum (about $75 USD) per year. The Bhutanese government is notably generous in leasing land for waste recovery ventures at affordable rates. Tshering Dorji of Evergreen Waste Care and Recycling. Collecting sufficient materials is a challenge, so Tshering Dorji has developed relationships with schools and nearby villages, which sell him their recyclable materials at about half the rate of resale. He also buys bottles from the village’s only homeless man, who survives as an informal waste picker thanks to Tshering’s scrap business. Tshering purchases bottles at about 7 ngultrum (about 10 cents USD) per kg, then resells them at the border town of Phuentsholing for double that. Bhutan’s SW border town of Phuentsholing is a 1-2 day drive from Trashiyangtse, depending on road conditions. Road blocks are common and, once he makes it to the SE border with India, strikes in India’s NE state of Assam can block the road for days. But the primary problem with transportation is cost. Tshering Dorji must hire a large vehicle to transport his materials to Phuentsholing, which costs upwards of 11,000 ngultrum (about $165 USD). In Phuentsholing, he can earn around 67,000 ngultrum (about 1,000 USD) for the materials that he has already purchased for about 35,000 ngultrum (about $520 USD). This puts his monthly earnings at roughly $300 USD, hardly enough to cover his mortgage payments to the Bhutan Development Bank, which come with a hefty 13% interest rate. Tshering Dorji knows that his current business model isn’t sustainable unless he can come up with the funds to afford a PET bottle bailing machine, which would enable him to transport more materials in a given trip, and sell them for a higher price. But, at 180,000 ngultrum a pop, he can only afford a bailing machine if a well meaning CSO or patron is willing to provide him one. For this, he’s spent the past year soliciting support from governmental and non-governmental institutions. Governmental institutions want to see his business flourish before they are willing to fully support him, and municipalities are primarily interested in businesses that will cover the dual collection of recyclable and non-recyclable materials. 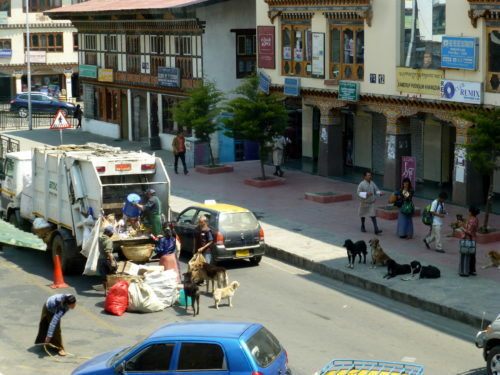 Municipal waste collection in Thimphu. In Bhutan’s urban areas, scrap dealers have had more success. Thimphu’s Greener Way has established itself as a dynamic and thriving recycling business, relying heavily on the purchase of materials from about 100 local informal waste pickers. Greener Way makes use of a bailing machine, a plastic extruder and, soon, a municipally-sponsored waste transfer station. Once Greener Way’s transfer station is up and running, they will be able to bring in more recyclable material, which will afford them the ability to buy materials at the same price that pickers and dealers get by selling materials in Phuentesholing (a 6-7 hour drive from Thimphu). With more materials and a bigger truck, Greener Way will begin transporting materials directly to Kolkata, where profits are higher. While this is clearly a step in the right direction for the organization of Thimphu’s waste management system, time will tell whether or not the increased formalization of waste recovery ultimately squeezes waste pickers out of the equation the way it has in many countries. Scrap dealer in Samdruo Jongkhar. Bhutanese scrap dealers, particularly those in non-border town locations, are often formally educated and have at least enough means to purchase a small vehicle. Scrap dealers like Tshering Dorji cite the need for training in proposal writing, effective budgeting and recycling business development suited to the local context. The provision of low interest loans for scrap dealers would also better ensure their long-term viability. The promotion of scrap dealers will inevitably support the informal waste picking sector. But other provisions, like places for waste workers to store their materials and wash their hands and bodies, and mandating and enforcing the household and institutional segregation of hazardous and sanitary waste, would directly benefit informal waste workers by protecting their health and by raising public awareness about the many benefits of Bhutan’s quiet informal waste sector. Taylor Cass Stevenson (www.livedebris.org) worked as a waste reduction specialist for the Samdrup Jongkhar Initiative (www.sji.bt) in SE Bhutan from 2012-2016. The Samdrup Jongkhar Initiative is a Bhutanese-run Civil Society Organization. This article is part of the series Scenes from the Heart of Recycling.